This is Lindsey, I adopted a bearded dragon with MBD from you a month or so ago. I wanted you and your fellow staff members to know how well he is doing and how much my students love him. His name is now Ivar which who was a Viking king who was disabled. Ivar surprisingly loves all the kids and certainly has his favorites. He has shown no aggression or fear when it comes to our classroom. He attends many classes to teach kids about reptiles as well as the large amount or work it takes to care for them. I have had several parents tell me how much of an impact him being in my classroom has had for their students. Many students struggling to engage with school have become very attached to him and he has become a motivator to those students. He also is a mascot for students with disabilities and I talk to students about how he perseveres even though he has a handicap. 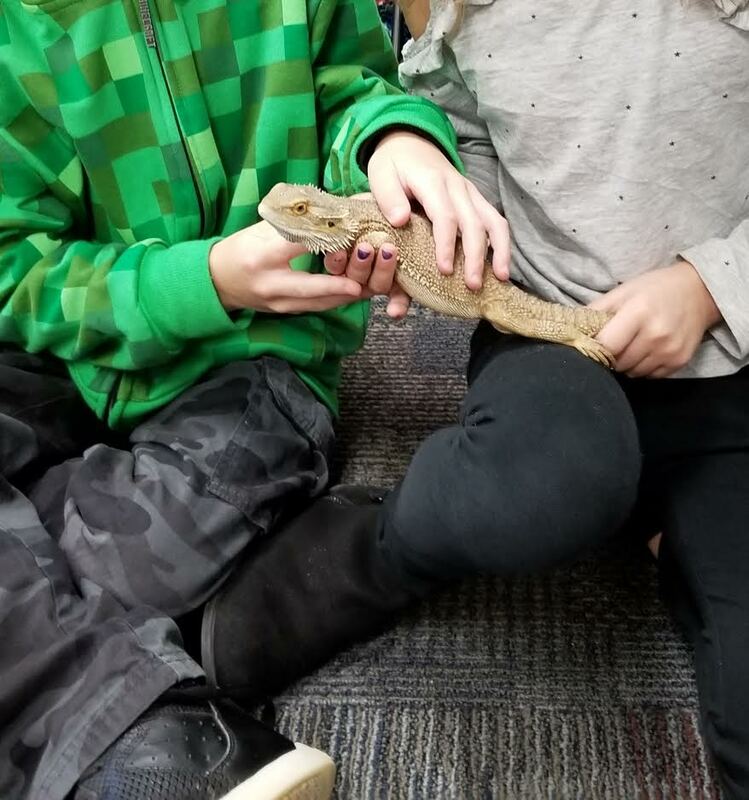 We all really appreciate you allowing us to adopt him and allowing my students the opportunity to have an animal around with disabilities same as theirs. He is extremely beloved to us and we are so thankful for his presence in our classroom. Most people do not think of an alligator as a lovable companion (for obvious reasons). Alligators are natural predators with fearsome features such as protective osteoderms, muscular tails, and bone shattering chomps. Also, they are illegal in most of the country without government-issued permits. Mr. Stubbs, a 12 year old American Alligator (Alligator mississippiensis), was illegally held with 31 others by one man in California. Based on X-ray observations, trauma had been induced to his remaining vertebrae, most likely from a larger alligator in the group. During feeding frenzies, alligators will eat everything and anything fleshy, including their own kind. Stubbs has spent most of his life tailless, which is a serious handicap for an alligator. Crocodilian tails are the primary method of locomotion in the water. It also stabilizes their bodies on land, and stores vital nutrients during wintertime, similar to a bear surviving hibernation. When Mr. Stubbs arrived at PHS, he was thin, panicked at feeding time, and generally high stressed and under nourished: not a good combination for an animal trying to survive under any settings. When the curators at PHS first saw Mr. Stubbs, an overwhelming sense of need to help this clearly special needs creature came over the group. Stubbs had a second chance at life. 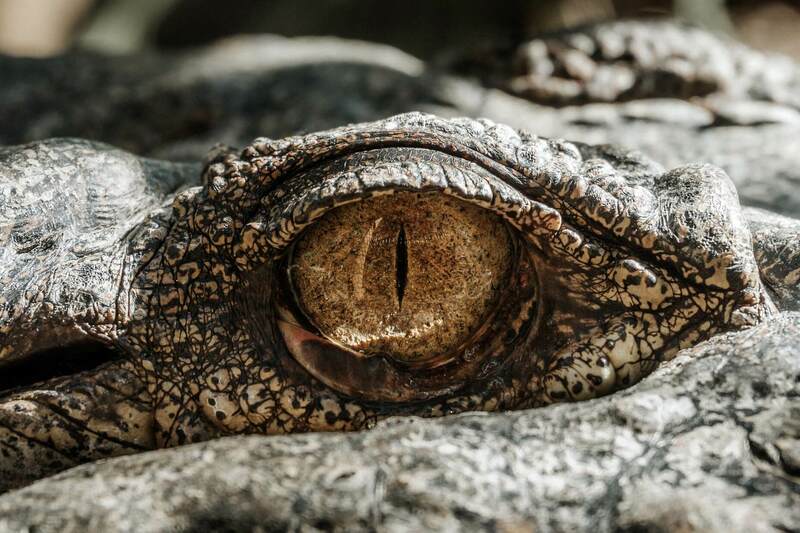 After more than 6 months of specialized feeding and attention, Stubbs looked and acted more like the other alligators and less like the picked-on animal he once was. Mr. Stubbs lived at PHS for years before his guardian angel, Dr. Marc Jacofsky, visited the facility and met the animal that would change his life. In January 2010, he started a research project with the mission of creating a new tail for Mr. Stubbs. Dr. Jacofsky and a team of scientists, doctors, and researchers worked tirelessly to engineer a prosthetic tail for Mr. Stubbs. While human prosthetics have been around for thousands of years, in 2012 the very first alligator prosthetic was developed by the CORE Institute in Phoenix, AZ in conjunction with Dr. Justin Georgi Midwestern University for Mr. Stubbs. It had to be just right, with proper proportions, weight distribution, density, and size for the growing alligator to maintain normal posture and movement while walking as well as balance and locomotion in the water. Mr. Stubbs never fought his new tail or hesitated once it was harnessed on his back legs. He immediately slid into the swimming pool where he gets his physical therapy and began swimming as any normal alligator would. It’s an amazing transformation that has drastically improved his quality of life. He is now able to swim efficiently, walk straight when he is on land, and enjoy moving like an alligator should. If PHS had not rescued him, Mr. Stubbs would likely have drowned or starved to death. Mr. Stubbs lives at the PHS facility in Scottsdale, AZ and will stay there for the rest of his life. Alligators, especially special needs alligators like Mr. Stubbs, need specific care that individuals or families are not allowed to provide. His new family members are his alligator roommate, Baby, and his caretakers at PHS. They help him thrive with physical therapy, exercise, and a healthy living environment. Dr. Marc remains “attached at the hip”-bone to Mr. Stubbs. He continues to improve and develop his prosthetics as well as visit him on a regular basis. 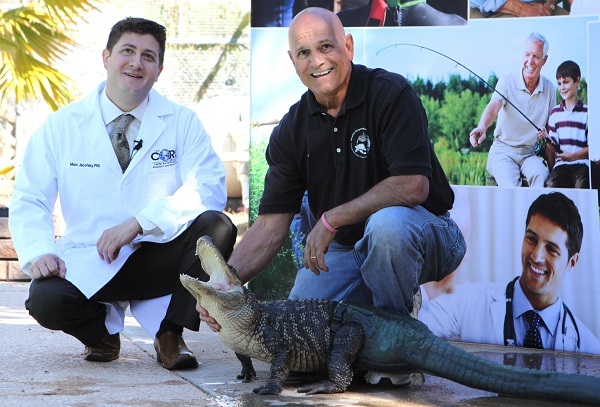 Since individuals cannot own alligators in Arizona without a permit, Dr. Marc has essentially adopted Mr. Stubbs through sponsorship. Dr. Marc has been and continues to be the reason that Mr. Stubbs has improved so drastically and maintains a better quality of life before his rescue. 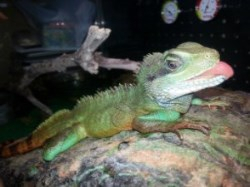 Prometheus is a Chinese Water Dragon (Physignathus cocincinus) whose story can make even the worst reptile-phobic person appreciate his life and will to live. He was surrendered to the Phoenix Herpetological Society by an owner who said they could no longer care for him. At first glance, he was listless, did not move or open his eyes and clearly needed special attention. After two weeks of being force fed and not showing improvement, Prometheus was taken to a local exotic vet. After the vet evaluated his condition, he explained that Prometheus had had a rough life, with many years of neglect and that he was older than the owner had stated at the time of surrender. His body size was less than half the size of a healthy adult Chinese Water Dragon and he must have had poor quality nutrition for his entire life. The vet also found a history of fractures all over his body, including a recently healed jaw fracture. In addition, Prometheus had an eye infection that had been untreated for months because prior to surrender, he had not received proper medical treatment either. The vet prescribed antibiotics for the eye infection and a calcium supplement to mitigate the devastating condition of his bones. 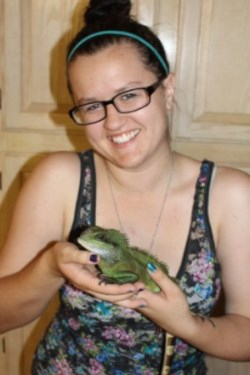 Vicky Kramer, a volunteer at PHS, has always admired Chinese Water Dragons, and offered to foster Prometheus for his recovery. She constantly monitored, cared for, and prayed for Prometheus. She provided proper habitat and husbandry for him including increasing his habitat’s humidity, providing proper heat and lighting, manually feeding Prometheus daily, and administering his medications. Vicky devoted herself to the rehabilitation and survival of her new foster animal and after a month and a half of tireless dedication, she began to see improvement in Prometheus. First, she saw color changes in his face (mouth and skin) and then his eyes. His energy level increased; he was on the mend! He was still unable to feed himself, so she continued her mission of healing this animal. After two and a half months of daily care and countless hours of effort and concern for Prometheus, he finally began to eat on his own. For a foster parent like Vicky, this is a huge victory! Ever since then, Prometheus has grown and thrived. Vicky was so impressed by his will to live and perseverance that she adopted him from PHS and added him to her family permanently. She says that now he is very energetic and is always watching what his human companions are doing. He likes to be held in a towel and petted on the head. She says he is sweet, an “amazing eater”, and that he jumps across his habitat, in and out of the pool, and seems very happy. We are sure that Prometheus is grateful for his new lease on life and his new, loving family. You can see that he is now happy and healthy and getting ready for his first Halloween with his new sister!